When a solid surface is bombarded with energetic particles such as accelerated ions (most commonly Ar ions), surface atoms of the solid are scattered and due to collisions with accelerated ions, atoms are ejected out of the surface as shown in the schematic diagram. These ejected atoms from the source (target) are then deposited onto the substrate to form a unifornm thin film. This phenomena is called sputter deposition. When a thin foil is bombarded with energetic particles some of the scattered atoms transmit through the foil. The phenomena is called "transmission-sputtering" . The number of atoms ejected per incoming ion is the sputter yield. 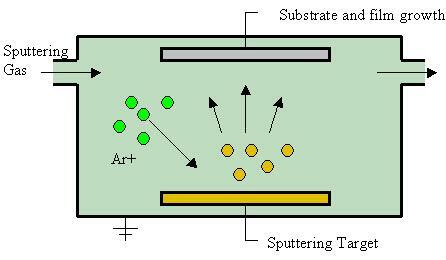 Sputtering is a relatively high energy process, the sputtered atoms leave with several eV (much higher than evaporated atoms which have around 0.1eV). This high energy is very good for the thin film growth process. It leads to hard dense films.